Glasgow Rangers striker Francisco Sandaza was duped into admitting he only moved to Ibrox simply for money by a Glasgow Celtic-supporting taxi driver posing as an MLS agent. A Glaswegian taxi driver called Tommy somehow obtained the Spanish forward's phone number, pretending he was Jim McGonagle, a fictional MLS agent looking to sign European players to American clubs. Sandaza immediately took the bait, and the Spaniard was only too happy to express his true feelings about being at Rangers to a faceless voice he'd only just be introduced to down the phone line. "I didn't sign for the level, I signed for the money. 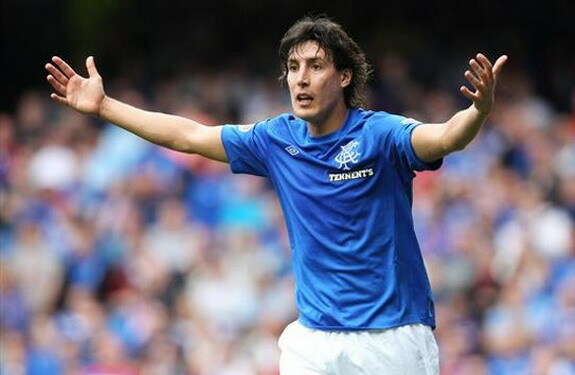 I'll get another contract after Rangers," said Sandaza, who was signed from St. Johnstone at the start of the season. When "McGonigle" enquired about a possible move to the MLS, Sandaza made it painfully obvious that he did not want Rangers involved and was ready to conduct business behind his current employers' back. He added: "Do not do it officially through the club. Send me the contract first. I don't want trouble if Rangers find out about this." Sandaza's comments are unlikely to be taken well by the many loyal followers of the Scottish giants, and it would be no surprise to see the Rangers faithful immediately turn on the Spaniard and demand that he be shipped out the club as soon as possible.